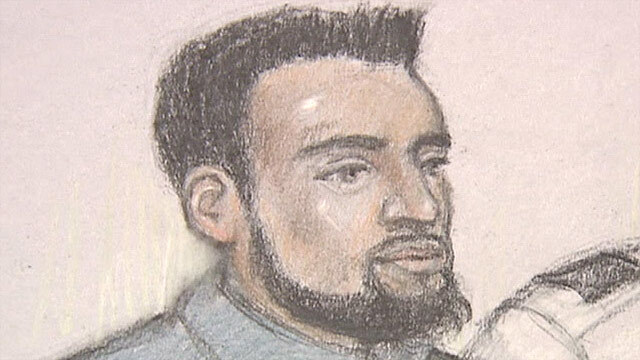 An artist's sketch shows Rajib Karim during his first court appearance on Thursday, March 11. London, England (CNN) -- A British Airways worker charged with preparing to commit and fund terrorism will face trial next year following a pre-trial hearing Friday in London. Rajib Karim, 30, an information technology developer for the airline, was arrested last month. At a hearing earlier this month, prosecutor Colin Gibb called Karim "a very dangerous individual, facing very serious offenses and likely to face a serious term of imprisonment." Authorities said Karim -- who was born in Bangladesh and is now a British citizen -- collected money in Britain and sent it to Yemen and Bangladesh to fund terrorist activities. British authorities believe he had significant success in financing terrorist operations, security sources with knowledge of the case told CNN. He volunteered to recruit suicide bombers and to be one himself, prosecutors said in court. He said he would go to Yemen or Pakistan for training, they charged. Karim, from Newcastle-upon-Tyne, England, is charged with two counts of engaging in conduct in preparation of terrorist acts and fundraising for the purpose of terrorism, London's Metropolitan Police Service said. The alleged offenses took place between April 13, 2006, and February 25, 2010, "with the intention of committing acts of terrorism outside the U.K. or assisting another to commit such acts," police said. Police learned about Karim's alleged activities from encrypted data on his computer at home, which was seized when he was arrested last month. He used his position at British Airways to advise foreign terrorists on airport security measures, including suspicion scans, liquid allowances and computer systems, prosecutors alleged. He is also accused of offering to take advantage of the current strike by British Airways cabin crews. Prosecutors believe he advised his contacts that because of the industrial disputes, he might have the opportunity to apply to join a cabin crew, giving him information on cabin crew training and on-the-job activity. BA is shuffling some staff to cover cabin crew positions left vacant by the strike. Authorities did not say whom Karim was aiding or reporting to. They are investigating possible connections to terrorists in Bangladesh, Pakistan and Yemen, security sources told CNN.